Two Wood River Valley kayakers made a big splash by winning their events at the inaugural North Fork Championship kayaking competition June 8-9 on the North Fork of the Payette River near Banks. For his efforts Casey won $4,000, a gold bib, a crown, the title and an invitation to this year's "Whitewater Grand Prix" competition in Chile. Representatives of Ketchum company and event co-sponsor Smith Optics attended the competition. Casey's entry fee was covered by Smith Optics. Benjamin Luck, a 2006 Community School graduate and Hailey native, won Friday's "Wild Card" competition and captured the Expert class title at the two-day contest that attracted nearly 100 kayakers. Luck won $500 for his victory. It's not the first rodeo for Casey and Luck on the waves. Casey and Luck were two of six kayakers who in Oct. 2010 became the first team to run the upper reaches of the Huallaga River in Peru. That river runs down the eastern slopes of the Andes Mountains and into the Amazon River valley. Here in Idaho last weekend, Saturday's giant slalom featured four gates through Jacob's Ladder and Golf Course's Class 5-plus Payette River whitewater. The Elite division was comprised of 30-top paddlers from all over the world. Athletes got two timed runs, and the better time was kept for their score. Casey's was 2:17.47. Paddlers flew off a ramp above Jake's to initiate the start of their run, and continued through the end of Golf Course where their time was taken. Carey turned in the fastest time and was crowned King of the North Fork Champion. Friday's boatercross-style downriver race was held on a three-mile course through Class 4/5 whitewater. It was an all-out sprint where stamina and skill prevailed. The top five finishers led by Luck were called Wild Cards. They received cash prizes, and an invitation to compete Saturday in the Elite Division race down Jacob's Ladder/Golf Course. 1—Ben Luck, Cordova, AK, received $500 cash. 2—Darren Albright, Gig Harbor, WA $200 cash. 3—Zach Fraysier, Atlanta, GA. $100 cash. 5—Wilz Martin, Manakau, New Zealand. 1—Ryan Casey, Hailey Idaho, $4,000, gold bib, crown and title. 2—Tyler Bradt, Missoula, MT, $2,000. 3—Mikkel St. John-Duncan, Nelson, B.C. Canada, $1,000. 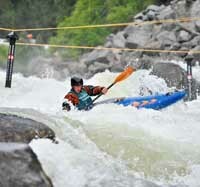 The Elite Division's Top 2 placers received invitations to 2012's "Whitewater Grand Prix" competition in Chile.